It’s nearly that time of the year again, when the department stores start rolling out their Christmas decorations and the streets start to fill with desperate shoppers scrambling to find the perfect Christmas present for a loved one. If you’re the kind of person who needs a little boost to help get you into the spirit of the season, thankfully there are several great Christmas themed slot games you can play online. These jovial games are filled with all kinds of festive treats that will not only kick start that childish nostalgia within but hopefully provide a boost to your bank account that will leave you feeling less like the Grinch and more generous around the silly season. 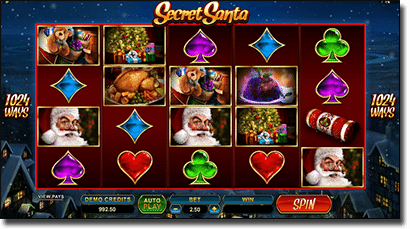 Secret Santa by Microgaming has all the iconic Christmas symbolism that is sure to get your heart in the right place. This five reel, 1024 way slot game features symbols made up of Father Christmas, turkey dinners, bonbons, stockings stuffed with toys and roaring fireplaces. Secret Santa is just the right recipe for nostalgia and cheer. The Secret Santa Bonus is triggered at random and awards you one of seven mystery features including free spins, wild reels, mystery multipliers and a scatter spree. Play with the speakers up to enjoy a jolly Christmas carol soundtrack and you’ll be feeling the spirit in no time. Try Secret Santa at Royal Vegas. Playtech’s Ghosts of Christmas slot game is based on the Charles Dickens classic tale, A Christmas Carol. The cinematically animated intro to the game sets the scene, where the bitter old Scrooge receives a message on Christmas Eve that he’ll be visited by three different ghosts over the course of the evening. The game itself is a little lacklustre in comparison to the exciting video intro, but has some bonus games that makes it well worthwhile, taking you to a mini-game of either Christmas Past, Christmas Present or Christmas Future where you select items to hopefully reveal cash prizes. Ghosts of Christmas is the standout for punters who want to play something a little festive while avoiding all the kitschy Christmas icons like Santa, presents and reindeer. Ghosts of Christmas is available to play at Slots Million Casino. Microgaming has combined festive Christmas cheer with fast cars, heavy machinery and hot women in order to create a game that appeals to the grease monkeys out there. Santa’s Wild Ride is a take on what the North Pole would look like if the elves were busy creating motorcycles and hot rods instead of toys and games. Santa roars in on a Harley, an elf proudly works with a drill and what we can only imagine is a young Mrs Clause (or perhaps just Santa’s secret tattooed mistress) enjoys the wind in her hair on the back of the sleigh. You’ll still find classic Christmas symbols here like puddings, mince pies and gingerbread cookies, but mixed in with beer and hefty sandwiches, for the manly Santa on the go. 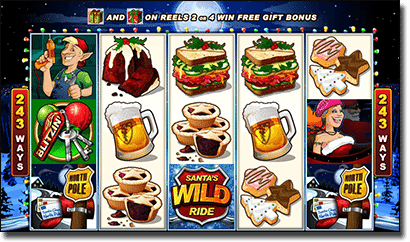 Santa’s Wild Ride is available at Microgaming powered casinos like Guts Casino. 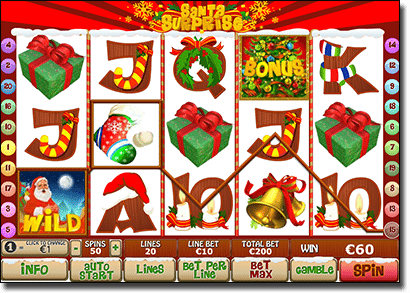 Santa’s Surprise by Playtech is a simple, Christmas themed slots that uses colourful cartoon graphics and a festive soundtrack of various classic carols that appeals to the kid in all of us. If what you want is Christmas trees, fairy lights, Santa, candles, wreaths and candy canes then look no further. Despite the games basic design, Santa’s Surprise comes with several bonus features that will really make you feel like all your Christmas have come at once. There’s a standard gamble feature that’s backed with a jazzy Christmas tune, free spins with a 3X multiplier and a Christmas Gift Bonus that takes you to a dazzling Christmas tree where you get to choose from one of three mystery presents. It’s impossible to feel Grinchy when you land a win and jingle bells start ringing as elves appear to wish you a Merry Christmas. 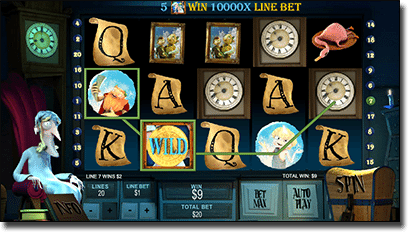 You can try Santa’s Surprise at Slots Million. Santa Paws isn’t overly Christmassy, it’s simply a bunch of arctic creatures in festive garb but is sure to suit the animal lovers amongst us. Symbols consist of images like whales wearing reindeer antlers, seals juggling presents on their flippers and a smug wolf skiing his way to the post office to deliver Christmas cards. However, there are some potentially lucrative features, including a gamble option and the possibility of unleashing 12 free spins with a 7X multiplier. You can play Santa Paws at Royal Vegas. Coming December 2015, NetEnt is scheduled to unveil its first ever Christmas themed slot games, not be left in the dust by other software developers. NetEnt has revealed that two of their favourite existing slots, Fruit Shop and Flowers, will both be receiving Christmassy makeovers to bring them into the festive season. 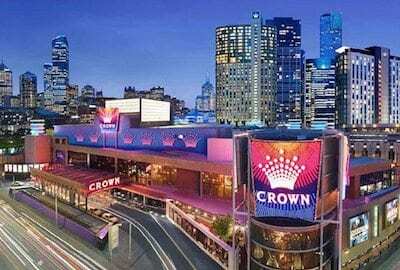 The Flowers and Fruit Shop Christmas Editions can be found at our recommended NetEnt casinos, like Guts and SlotsMillion.com, come December. Get into the Christmas spirit by playing these festive slots at our recommended casinos today. 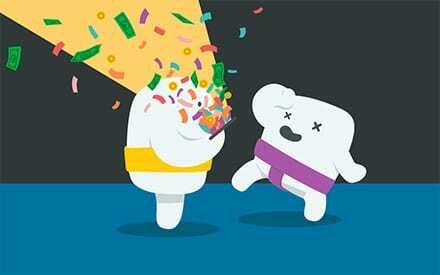 Follow our links to receive new player welcome bonuses and you’ll be feeling the Christmas cheer in no time!